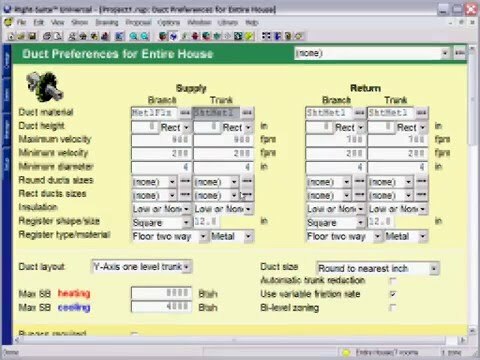 Right-D® is a fast, easy-to-use residential duct sizing and calculation software that takes full advantage of ACCA's and ANSI’s standard Manual D Method. A proper Manual D duct design with Right-D® will help to quickly find which fan, coil and filter combinations will work together to achieve optimal results and best suit you and your customer. Simply set your system’s external static and pressure drops, select your duct library, and draw your ducts where you want them. Or choose to utilize one of auto-draw systems. Right-Duct® will select the fittings, measure the actual and equivalent length of the runs and size, calculate the appropriate friction rate for each duct, as well as properly size the ducts for you. View overview video. In conjunction with Right-Draw®, you may draw your duct design, or simply place the registers where you want them, and allow Right-D® to design your layout for you. Using both of these products together also allows the instant calculation of friction rates of each run with every change made in Right-Draw®. Right-D® features the complete ACCA fitting list, which can be modified and saved in libraries for re-use. Automatically size your ducts and registers. This program will choose the right duct sizes for your project based on airflow, static pressure and user selected fittings. Automatically reduce riser size for 3 or more floors. Automatically place registers within a floorplan. Once your floorplan has been established in Right-Draw®, Right-D® will place your registers for you with the click of a button. Right-D® can also instantly connect branches to trunks to save you time. Easily view ducts by system. Right-D® is color-coded to help define which system you are viewing. Ensure a properly design system. Let Right-D® be your second set of eyes by highlighting fittings that do not fit together properly. Duct CFM and sizes will automatically adjust with any load changes. Draw trunk line then click button to have branches auto connect to trunk saving you time. Use Special Trunk Move Mode to simultaneously move all branches and takeoffs when moving the trunk line saving you time. Size ductwork using one of the following methods: Equal Friction, Modified Equal Friction, Static Regain and Existing System. Right-D® is the ultimate Manual D design program for all skill levels. Simply set and save your preferences, draw your floor-plan with the help of Right-Draw®, and your duct design is practically done for you. If you wish to rely on your own design knowledge, you may also choose to design the system manually, and rely on the smart features if ever in doubt. Either Right-J®, Right-F280™, Right-CommLoad™, or Right-N®. We highly suggest Right-Draw®.